On the face of it, this series seems a simple walkover for two bottom ranked teams headed in opposite directions. Since making a triumphant return to Test cricket by humbling the Bangladeshis and pushing the Pakistanis and New Zealanders, Zimbabwe has been struggling of late across formats. On the other hand, Bangladesh has gone from strength to strength in the past 15 months by somewhat successfully hosting the Bangladesh Premier League, coming within 3 runs of winning the Asia Cup, and an ODI series win against the West Indies plus another series drawn in Sri Lanka, and posting their best Test totals in successive tours. The author previews the tour. On the face of it, this series seems a simple walkover for two bottom ranked teams headed in opposite directions. Since making a triumphant return to Test cricket by humbling the Bangladeshis and pushing the Pakistanis and New Zealanders, Zimbabwe has been struggling of late across formats. On the other hand, Bangladesh has gone from strength to strength in the past 15 months by somewhat successfully hosting the Bangladesh Premier League, coming within 3 runs of winning the Asia Cup, and an ODI series win against the West Indies plus another series drawn in Sri Lanka, and posting their best Test totals in successive tours. However easy a prediction might seem on paper, this is an important series for two teams who don’t play nearly enough cricket otherwise. The Birds still haven’t played enough matches to make definitive statements about their team, but the recent trends don’t look good. In their last 3 Tests - all away matches – Zimbabwe are averaging a disappointing 13.80 with a highest total of just 211. They have managed just 2 individual fifties as a team from 6 completed innings, with a top score of 63. They have, however, looked far more comfortable at home. Bangladesh will be facing a stiff challenge from multiple fronts. The ZC (Zimbabwe Cricket) have changed the order of the series in order to maximize their home advantage, opting to play the 2 Tests first. The Harare pitches have been re-laid, and one can only expect that they will remain more seam friendly than spin friendly. Bangladesh also have the challenge of confronting their humiliation during their last tour. 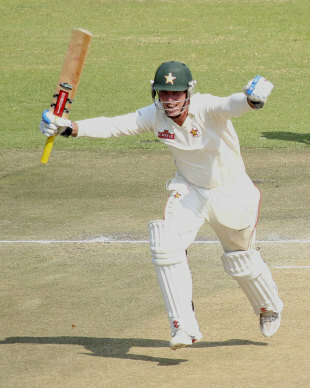 Zimbabwe will look towards Brendan Taylor for guidance. He has been their best batsman by some distance in all three formats of the game. While he hasn’t been in good form recently, the comfort of playing on home soil should shift the odds in his favor considerably. He can take the game away from Bangladesh if he gets going. Senior batsmen Hamilton Masakadza and Vusi Sibanda will also play a crucial role in the outcome of the game. Sibanda in particular has a strong technique, but has been guilty of throwing away starts throughout his career, as evidenced by the fact that he has just a solitary international century. Masakadza meanwhile needs a strong performance in order to deflect concerns that he is an inconsistent “minnow basher” as well as to solidify his role as a senior statesmen in the team. Sean Williams, the talented left-hander, has also returned to national colors, and made his Test debut in the just concluded series against the West Indies. His batting ability will be invaluable for Zimbabwe’s inexperienced side, and he offers part time left arm spin to boot. Zimbabwe will really miss the injured Tino Mawoyo. Like most of the rest of the lineup, he faltered in their recent tour to the Caribbean, but he also hit their only fifty plus score. With the luxury of a more free-stroking Sibanda at the other end, Mawoyo could have focused on taking the shine off the ball, a feat he exemplified against Pakistan by batting out an entire day to only score 80 runs, and carrying his bat for an astonishing 150 overs. The absence of Craig Ervine continues a disturbing trend of players disenchanted with the ZC and preferring the compensation of overseas club cricket to the fame of internationals. Malcolm Waller lends talent to the middle order, but has not yet justified it with big scores. He will look to break the jinx against Bangladesh’s weak bowling attack. Elton Chigumbura makes a return to the preliminary squad, and given his experience and all-round capability may make the selectors think. The downside is that he has disappointed more often than not for the past several years. Other names that will get serious consideration even if they end up missing out are wicket-keepers, Regis Chakabva and Richmond Mutumbami who has impressed in the Logan Cup first class league by leading the run-scorer’s tables. Chakabva hasn’t grabbed a hold of a roster spot in his limited chances, and thus Mutumbami might earn a Test cap. Pakistani import, Sikander Raza, and Timycen Maruma may also end up featuring in the series. Will Kyle Jarvis be a handful? Fans have been both frustrated and optimistic with the bowling in recent times. The aging Ray Price, long the lone strike bowler in a post-Streak attack finally seems to be nearing the end of a solid career. He was not picked for the limited overs matches and only played in half of the Test series. 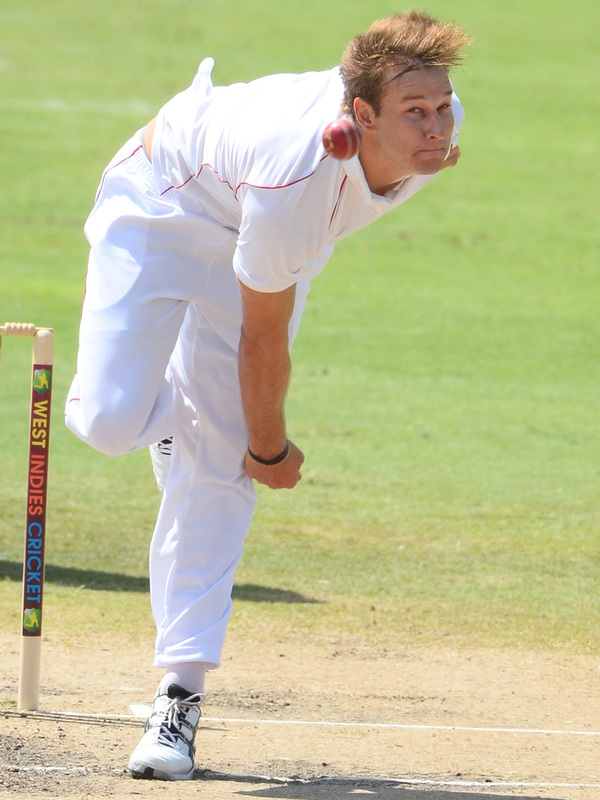 In his absence, seamer Kyle Jarvis has impressed. He took a crucial 4-wicket haul in the return Test against Bangladesh in 2011, helping his side to a comprehensive win, and has backed that up with five-fors against both New Zealand and West Indies, home and away. While not express, he has just enough pace to be effective when used skillfully. The second seamer’s spot will be decided between the incumbent debutant Tendai Chatara and the physically imposing Shingarai Masakadza. Chatara has started his career well with 4 wickets in his debut series, including the dismissal of the dangerous Chris Gayle. It is likely that the seam friendly surface of Harare will see all three of Jarvis, Masakadza, and Chatara in the bowling attack. The only downside of that is that all three are genuine tailenders, increasing pressure on an already fragile batting lineup. Elton Chigumbura offers part time medium pace, though he is not certain to play. It’s fairly certain, that only one specialist spinner will be picked, and it’s anyone’s guess who that will be. The odds favor Prosper Utseya who played ahead of Price in the most recent match and took 3 wickets as well. Bangladesh would prefer a defensive off spinner like Utseya on a track not expected to be spin friendly. The young leg spinner Graeme Cremer may also be in the mix, although his record to date has been less than pleasing. However, in the event that Price is picked, he is sure to keep things interesting and ruffle some feathers in the opposition camp with his penchant for expressive antics, not to mention exceptionally tight bowling. For a team likely to be missing its premier specialist batsman, and with a history of poor scoring ability, Bangladesh arrive at Harare with uncharacteristic optimism. Bangladesh now have the discipline to put on big scores frequently. Most of the batsman likes to play strokes, and if the HSC track doesn’t offer much movement, then Bangladesh could see themselves to another healthy total. The absence of star opener Tamim Iqbal - at least for the first Test - will put pressure on the top order, but a similar lineup did score 638 in the recently drawn Galle Test against Sri Lanka. Jahurul Islam has looked good in spurts, but has managed to throw his wicket away when the going gets tough. He will have to reign in his self-destructive tendencies if Bangladesh wants a good start to proceedings. With Anamul Haque also out due to exams, the other opener slot is a question mark but Shahriar Nafees is probably the lead candidate for the job at this time. One-time ace, Mohammad Ashraful, made an unexpected return to the side due to a plethora of injuries and had one of the best series of his stop-start career. He fell agonizingly short of a maiden double ton, and could be looking at this tour as the best opportunity to finally cross that landmark. He was uncharacteristically solid throughout the Sri Lanka tour, and even his harshest critics will hope that this finally marks a turn-around for this former talisman. Mominul Haque, the young left-hander, should retain his spot as he had an excellent start to his Test career in Sri Lanka. He will need to work on his temperament in order to convert the starts he seems to regularly get into more significant contributions. Shakib al Hasan is one of those rare Bangladeshi cricketers who need no introduction and Bangladesh will hope that he is able to pick up exactly where he left off before an unfortunate injury. He is a man who cannot tolerate defeat and is never short on desire and this can only be fortuitous for Bangladesh as they seek to right the humiliation of their last two trips to Zimbabwe. Mushfiqur Rahim, the skipper, has been criticized for his unassertive approach to captaincy, but one cannot deny his outspokenness and aptitude for managing his boys and maximizing his resources. His batting has also improved since he’s taken over as captain, and has played a number of critical knocks in the past two years. As Bangladesh’s first double centurion, he will command respect from any attack tasked with bowling to him. Completing the middle order is a couple of batsman with seemingly opposite traits. While Nasir Hossain is green and fearless, Mahmudullah is more experienced and has yet to string together a series of consistently good performances. Riyad in particular struggled in the Sri Lanka Tests, but young Nasir has been a revelation. The only way Mahmudullah will crack a healthy starting XI is in place of Mominul, and that is not warranted based on most recent performance. This series marks the possibility of a distinct peculiarity for Bangladesh. They might simultaneously suffer from total ineptitude with their seam attack, while also delivering headaches to the opposition by way of their abundant spin resources. Sohag Gazi has given Bangladesh much to cheer about. Injuries and lack of depth means that Bangladesh has been forced to recycle some of the same bunch of fast bowlers who have failed to get results in the recent past. Shahadat Hossain seems a shadow of the fellow who once ripped match figures of 9 for 97 against a full strength South Africa side five years ago. He has been picked simply on the back of his history of 4 five-wicket hauls, the most recent of which was nearly three years ago. Since then he has been as feeble as a Chris Martin forward defensive. Rubel Hossain retains his place, and he bowled at a very nippy pace in Sri Lanka, but without much success. If he can get movement with the old ball back, he will become a more dangerous man to face. Robiul Islam also keeps his spot and needs to work on cutting the bad balls out of his repertoire. He can bowl a few wicket-taking deliveries in each spell, but he needs to be more consistent with that. Left-handed pacer Sajidul Islam comes back, almost from nowhere, and if he can bowl with control plus the swing he displayed in New Zealand several years ago, he will be a very handy variation to the attack. Bangladesh will rely on the spinners, regardless of what sort of track is eventually laid out. It makes perfect sense: it’s their strength, and Zimbabwe’s weakness. The bowling can contain if not attack, and constrict the flow of runs. Sooner rather than later, a wicket will fall. Shakib has been picked as a specialist batsman for the first Test, however, given his fierce competitiveness; it would not be surprising to see him bowling a fair number of overs, especially if the need arises. He will be tough to score off of, and his guile should earn him a few scalps. Sohag Gazi is the first specialist non-SLA spinner to don a cap for Bangladesh for as long as anyone can remember. Although the HSC tracks aren’t expected to assist spin, Gazi could be a handful if there is bounce on offer. Zimbabwe failed to cope with the slight turn and sharp bounce of Shane Shillingford in the West Indies and Gazi could pose similar problems for the hosts. Enamul Haque Jr makes a well-earned comeback after several years on the sidelines. Everyone remembers him for that delivery against Michael Clarke and the fact that he owns Bangladesh’s only 10-wicket haul in Tests, when he took 12 for 200 against Zimbabwe in Bangladesh’s maiden win. He is an attacking option, and if he gets in the groove, he will be dangerous. Given the most recent forms of the two sides, Zimbabwe’s continual off field problems, and Bangladesh’s latest history in the country, this marks a series Bangladesh cannot afford to lose. They must continue the good work and build upon the momentum of the previous year. Bangladesh have made strides as a team by crossing 550 totals twice in recent months, home and away. Several batsmen have made career best scores in the process. What’s more is that much of that has been done without their best known batsmen, Tamim and Shakib. Confidence is high, but Bangladesh must be vigilant against complacency. Bowling remains a serious concern, but with the return of Shakib, Bangladesh must believe they can win every game on this tour. Anything less will be interpreted as failure back home, and a total lack of improvement abroad. This page has been viewed 4939 times.